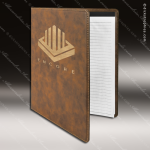 If you are looking for a great incentive, promotional item or personalized gift, look no farther than this beautiful leatherette portfolio. With the look and feel of genuine leather at a much lower price point, the portfolio can be personalized with your company logo, a monogram, or any other graphic you might choose. The personalization is a stunning gold in contrast to the rustic, and top-stitching around the edges gives a finished look. It includes a standard white legal pad and has an elastic strap to hold a pen and a pocket inside the front cover to hold receipts or other papers. This functional item is all that’s needed to keep things organized and at hand.